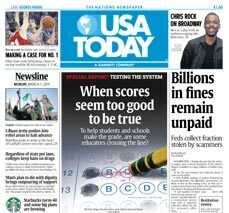 Washington D.C. – $15 for an 11-week weekday subscription to USA Today + a $5 contribution to the Flight 93 National Memorial Campaign. Miami – $35 for $100 worth of photo services from BritePix. Voucher may be used towards shipping costs. Detroit Families – $10 for $20 or $15 for $32 worth of organic baby goods from Organically Grown. Shipping not included. Cleveland Eastside – $28 for an 11×14 or $39 for a 16×20 personalized canvas print from MyPix2Canvas. Shipping not included. Cleveland Westside – $15 for $30 worth of personalized phone and laptop skins or cases from Skinit.com. Shipping not included. Dallas – $20 for $120 worth of SOTB Signature Line sunglasses, t-shirt, 2-year warranty and free shipping from SpecsOnTheBeach.com.